1. 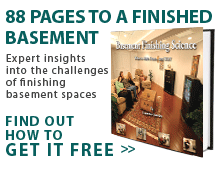 You want to have a comfortable, beautiful finished basement, BUT you want it to last! 2. Most contracting companies use standard “above-grade” materials which is a recipe for disaster. These materials end up with mold and mildew and you have to tear out the whole basement and start over. 3. Total Basement Finishing contractors eliminate these problems by only using completely waterproof, inorganic & mold-resistant materials that are designed specifically for basements. You will have the basement you've wanted and it will last long as your house. Once we’ve completed your basement remodeling project, we guarantee you’ll be as pleased and confident in our craftsmanship and sturdy materials as we are! Is quality for your dollar your biggest concern? Well, we value your hard-earned money and that’s why our craftsmanship and materials are of the best quality and our products are patented and sturdy. Get your ceiling tiles, basement flooring, windows, walls and energy efficient dehumidifiers—we’ve got them all. Each product comes with a 50-year-warranty against mold and moisture damage. Some homeowners want to remodel their basement before they put their home on the market, other homeowners just need the space, and then there are the homeowners that just want to have a nice mold-free storage space. Regardless of the situation, we’re the Alabama basement finishing company for you! For quality basement remodeling, years of experience, and impressive customer service—you’ve come to the right place. Our basement finishing experts are highly trained and love their job. We want to take your space from basement to beautiful and we have the resources and products to do just that. Finishing your basement is the most affordable way to increase your home's living space. But doing this construction work with standard "above-grade" materials is a recipe for disaster —in the form of mold, mildew and ongoing moisture problems. Total Basement Finishing eliminates these problems by only using waterproof, mold-resistant materials that are designed specifically for basement environments.